A hemangioma is a type of birthmark. It is the most common benign (noncancerous) tumor of the skin. 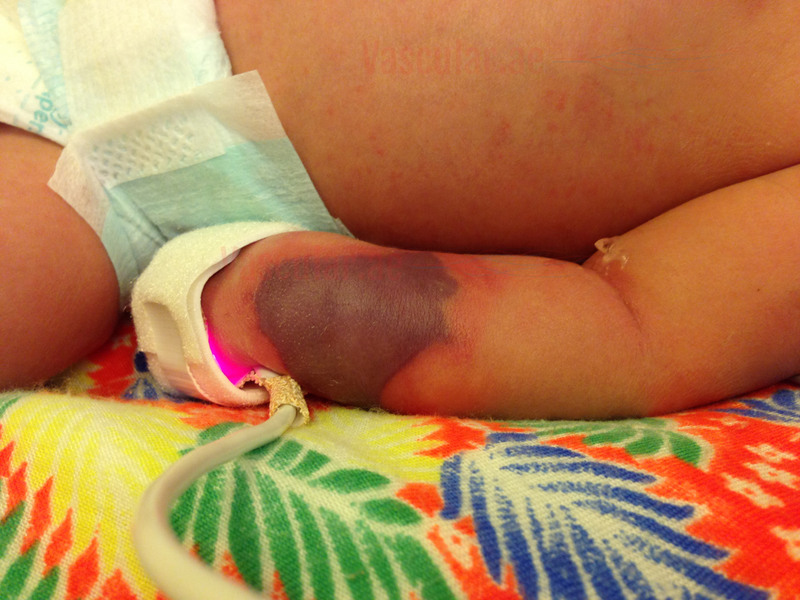 Hemangiomas may be present at birth (faint red mark) or may appear in the first months after birth. A hemangioma is also known as a port wine stain, strawberry hemangioma, and salmon patch. About 60 percent of hemangiomas occur in the head or neck area. Hemangiomas occur at least three times more often in females than in males. Most will continue to grow for the first six to 12 months of life before beginning to shrink. Most hemangiomas are not usually present at birth or are very faint red marks. Shortly after birth, however, they grow rapidly–often faster than the child’s growth. Over time, they become smaller (involute) and lighter in color. The process of involution may take several years. If a hemangioma or vascular malformation is very large or affects the breathing system (airway or lungs) or another large organ system, it could be life-threatening. If a hemangioma has uncontrollable bleeding, this could also be life-threatening. Depending on where a hemangioma or vascular malformation is, it may cause physical problems, such as with moving a part of the body or difficulty seeing. Large and/or life-threatening lesions should be evaluated by a multidisciplinary team of specialists that includes plastic surgeons, dermatologists, ophthalmologists, radiologists, and other specialists, depending on what organs are involved. Treatment for hemangiomas depends on their size, location, and severity. Treatment is usually not recommended for small, noninvasive hemangiomas, since they will become smaller (involute) on their own. However, hemangiomas that cause bleeding problems, feeding or breathing difficulties, growth disturbances, or impairment of vision may require medical or surgical intervention. Treatment for vascular malformations depends on the type of the malformation. Each type of malformation is treated differently. Laser therapy is usually effective for capillary malformations or port wine stains, which tend to be flat, violet or red patches on the face. Arterial malformations are often treated by embolization (blood flow into malformation is blocked by injecting material near the lesion). Venous malformations are usually treated by direct injection of a sclerosing (clotting) medication which causes clotting of the channels. Most often, a combination of these various treatments is used for effective management of the lesion.